Steven Jersky, Alexis Steyn, Nic & Kolo owner Ben Kon-Yu, Patty Powell, Eileen Giles and Elvira Jersky at the fundraiser for SOUL Care. A FUNDRAISER organised by Palmyra resident Elvira Jersky has raised almost $600 for the SOUL Care group of charities. During a visit to the Weeping Madonna of Rockingham earlier this year a meeting with twin sisters Eileen Giles and Patty Powell, who run SOUL Care, inspired Mrs Jersky. The organisation runs a soup patrol that provides food, basic necessities and information on the streets of Rockingham and also manages two homes for women and babies who have found themselves homeless. Following the meeting, Mrs Jersky decided to organise a high tea benefitting SOUL Care. Twenty people attended the event, which was hosted by Nic & Kolo in Applecross earlier this month. “Not only are Patty and Eileen totally committed to their cause but they tirelessly carry out their work with humility,” Mrs Jersky said. 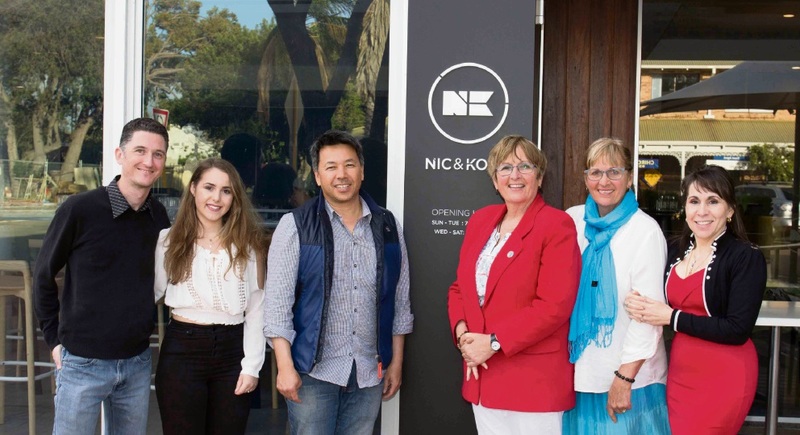 Mrs Jersky said Nic & Kolo owner Ben Kon-Yu joined the effort by providing the venue along with a financial contribution towards the menu. For more information about SOUL Care, visit www.soulincorporated.org.